Townsend's mother would often take her to hearings instead of to a playground, said Allen (shown below at left). "We learned early on," Townsend added, "that life was tough." As another lesson, she said, her father once returned from a trip to the Mississippi Delta to tell his children that he had seen some entire families living in homes only as big as their large kitchen at Hickory Hill in suburban Virginia, and that some of the children had bellies swollen from malnutrition. "Do you know how lucky you are?" she recalled him saying after one such trip. "You have a responsibility. You have to do something for our country." Kennedy was using the media, Allen said, to accompany him on trips such hidden poverty centers as the Mississippi Delta, Native American reservations and migrant worker camps. "He wanted America to see what he saw," added Townsend. The book is illustrated with photos and has a companion website with containing videos of memorable talks. A major theme of the book and lecture is that such words and lessons are applicable today. 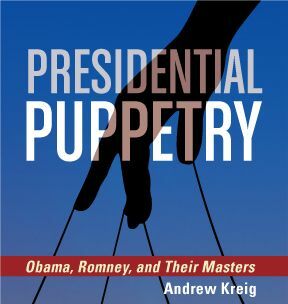 Thus, the book opens with introductory essays on that theme by former Presidents Barack Obama and Bill Clinton, plus five Nobel Peace Prize laureates, two Pulitzer Prize winners (including conservative Peggy Noonan, the principle speech writer for President Ronald Reagan), and others. The talk concluded with a question-and-answer segment, with highlights excerpted in a news account shown below. One matter that arose in conversation at a reception before the lecture but not during it was that Townsend and her brother Robert F. Kennedy Jr. were two of the family members of four prominent assassination victims during the 1960s to announce earlier this year that they support new official investigations of the slain leaders — Robert Kennedy, his brother John Kennedy, the Rev. Martin Luther King, Jr. and Malcolm X — because of compelling evidence challenging official accounts of their deaths. 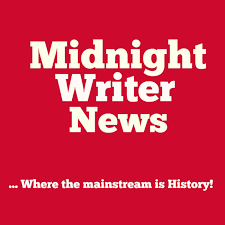 This editor and my guest, author Jefferson Morley, were two of the five dozen other signatories to the petition, which has led to formation of a Truth and Reconciliation Committee modeled on a similar movement created in South Africa after the apartheid era. The purpose? To establish truths, in both instances, without undertaking the necessarily controversial step of seeking prosecutions. The committee's website is here. The Justice Integrity Project maintains here a continually updated "Readers Guide to the RFK Assassination" referencing significant books and films illustrating all major points of view. 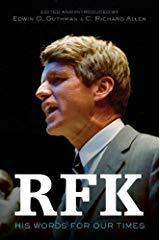 RFK's life and powerful legacy was the focus of the book and lecture, understandably enough. The book's publisher, the HarperCollins imprint William Morrow, maintains a website with video clips of major speeches. These include Kennedy's announcement on the evening of April 4 to a horrified crowd in the heart of the Indianapolis ghetto that Dr. Martin Luther King Jr. had been assassinated earlier that day in Memphis. 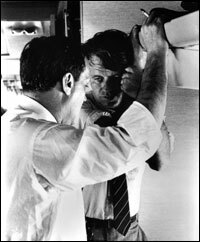 In the adjoining photo, Kennedy (at right) is shown in an iconic photo by Lawrence Schiller (via Getty Images) conferring about the news on the airplane ride to Indianapolis earlier in the day with Frank Mankiewicz, his press secretary from 1966 on. Local authorities had advised Kennedy even before the shooting that his campaign speech's locale might be too dangerous. Kennedy ignored the advice and stood on the rear of a flatbed truck to tell the nighttime crowd the news. "For those of you who are black," Kennedy said, " and are tempted to be filled with hatred and distrust at the injustice of such an act, against all white people, I can only say that I feel in my own heart the same kind of feeling. I had a member of my family killed, but he was killed by a white man. But we have to make an effort in the United States, we have to make an effort to understand, to go beyond these rather difficult times." "My own favorite poet was Aeschylus," Kennedy continued. "He wrote: 'In our sleep, pain which cannot forget falls drop by drop upon the heart until, in our own despair, against our will, comes wisdom through the awful grace of God.'" Kennedy was a unique white public official in America able to address a crowd in a black neighborhood that tragic night and not encounter violence. He spoke as a recognized champion of the disadvantaged, and he carried the credibility of his family's tragedy; in fact, this night marked the first time he had referred publicly to his brother's shooting. Whether Kennedy's appearance was a factor — and it seemed surely to have been — Indianapolis remained quiet while rioting broke out in 110 cities across the land, causing thirty-nine deaths, twenty-six hundred injuries, and tens of millions of dollars of property damage. Our project (which took the accompanying photos of the lectures) attends many book launches and other lectures. This one was exceptionally useful, thought-provoking and otherwise worthwhile in addressing, as advertised, RFK's "words for our times." 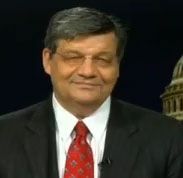 National Press Club, RFK’s civility, eloquence a lesson for today’s politicians, daughter says, Chris Teale, April 10, 2019. 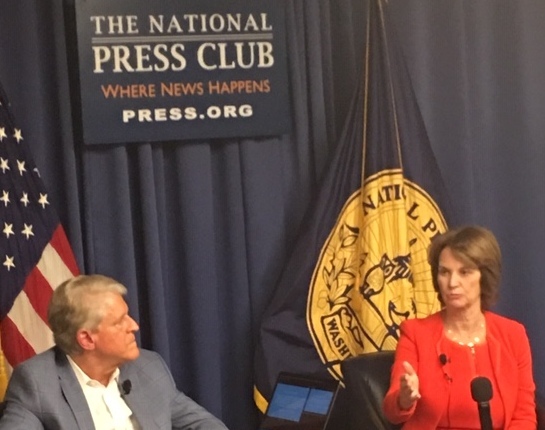 Robert F. Kennedy’s ability to win over hostile crowds and be civil during debates would serve politicians well in the present day, his daughter Kathleen Kennedy Townsend said at the National Press Club Wednesday evening. Townsend said Kennedy’s willingness to take on difficult opponents, like mob bosses or hostile crowds, calling for civil rights showed he wanted to engage with everyone and use civility while doing so. Along with co-author and editor Rick Allen, she discussed their book, RFK: His Words For Our Times, which collates Robert Kennedy’s speeches and writings and puts them in the context of their time. 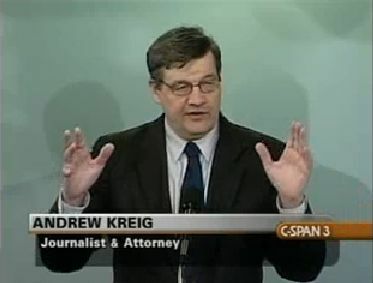 “He was able to win over people not by saying, ‘You’re selfish, you’re terrible,’ but by asking what kind of country you want to live in,” Townsend said of her father..
Justice Integrity Project: Kennedy and King Family Members and Advisors Call for Congress to Reopen Assassination Probes, Andrew Kreig, Jan. 20, 2019. An unprecedented coalition of family members, researchers, film makers, and former law enforcement and other government officials is calling for a new investigation of the four iconic 1960s assassinations. This editor is proud to have joined this effort by the newly formed Truth and Reconciliation Committee. Please help spread the word via social media and any other method. A petition signup page and new website for the committee will be announced early next week. Today's announcement, timed for release before the Martin Luther King Jr. national holiday in the United States on Monday, is provided below here and elsewhere. 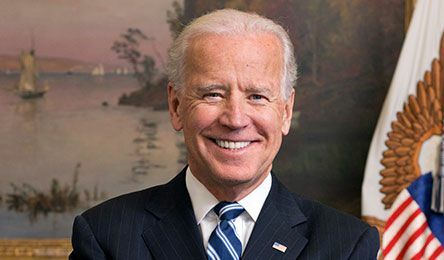 New York Times, Biden Is Running for President, After Months of Hesitation, Alexander Burns, April 26, 2019 (print ed.). Former Vice President Joseph R. Biden Jr. has stayed on the sideline while his record has been scrutinized. His entry has the potential to reshape the Democratic primary contest. 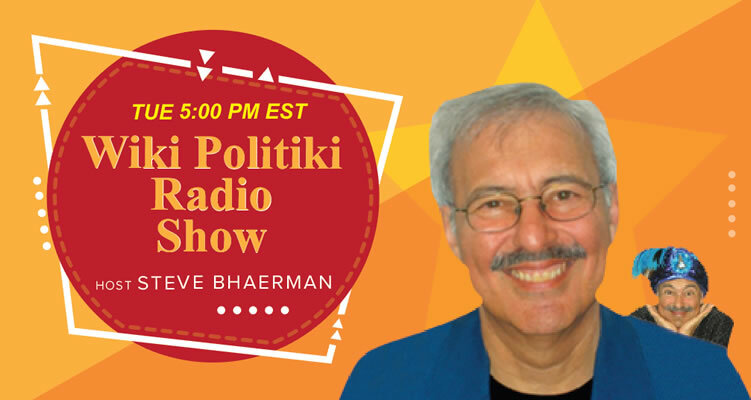 Palmer Report, Opinion: Welcome to uncharted territory, Bill Palmer, April 26, 2019. Donald Trump, in a last ditch effort to salvage his illegitimate and dying presidency, decided this week that the constitutional powers given to Congress no longer exist. He’s instructed all of his Executive Branch officials to simply ignore any requests, demands, or subpoenas that come from the House of Representatives. If he manages to pull it off, there no longer is a Constitution. We can debate if it’s part of some kind of perverse reelection strategy, if he’s doing this simply because he’s maniacally out of control and bent on self destruction. Either way, he’s forcing the House to impeach him, which will happen rather soon. The particularly tricky part is that the House has to put together a case for impeachment, and Trump is actively trying to prevent that from happening. Of course, in so doing, he’s only making the case for impeachment even stronger – and he’s handing House Democrats additional leverage when it comes to dismantling him. Because Donald Trump is now taking his obstruction of justice to such cartoonishly criminal fashion, House Democrats are preparing to have his regime’s officials arrested if they continue following Trump’s illegal orders to defy congressional subpoenas. We’re now entering that deep dark territory where government officials have to start arresting each other in the hope of keeping the basic tenets of our democracy intact. The stakes are even higher than you might think. 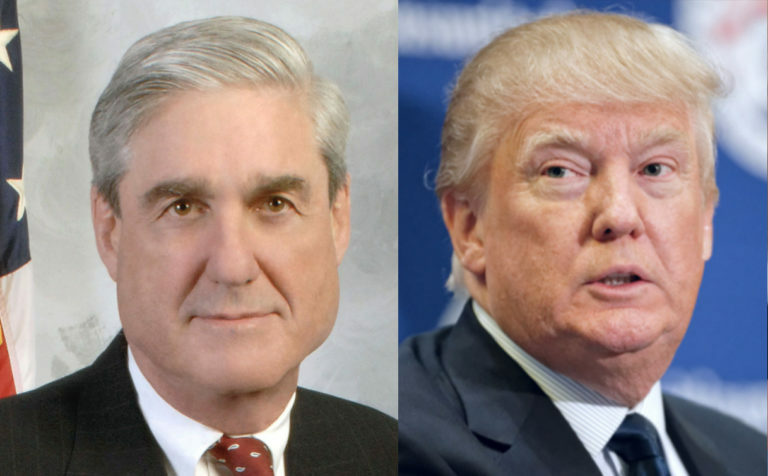 The Mueller report not only lays out the proof that Donald Trump committed a double digit number of felonies, it also explicitly spells out that Trump can be criminally prosecuted for them once he’s no longer in office. That means Trump will be arrested and indicted the minute he’s out of office. He knows it too. He’s single handedly trying to burn our democracy to the ground, in the hope of keeping himself out of prison.